Adoption of cloud technology by enterprises is on the rise. According to an IDG Enterprise study, 24% of the IT budgets will be spent on cloud solutions, like SaaS (Software-as-a-Service). Most enterprises today are fully or partially using cloud technology. In the coming years, this number will become significantly high. On-premise ERP systems are expensive. Only large enterprises could afford them. However, with the advent of cloud technology, small and mid-scale businesses can also take advantage of ERP systems. 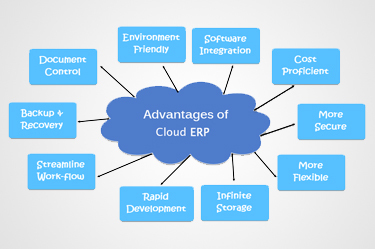 Cloud ERP systems are cost-effective, flexible and easy to implement. They are also now being viewed as viable investments by large enterprises. Is cloud ERP suitable for large-scale organizations? Large enterprises have a myriad of business processes. Most of them have offices overseas, and have multiple departments. The main challenge they face is operating their widespread network on a single platform. Traditional ERPs need to be physically installed on servers at every location they operate. This sends the IT costs spiraling. Language, accounting and taxation laws form another barrier. Cloud ERP addresses all these issues. True cloud ERP solutions are dynamic in performance. Since it is a cloud-based solution, there's no need of installation into local servers. It serves as a uniform platform for all operations and can also be customized to fit any need. Cloud ERP solutions offer the flexibility of incorporating local language, accounting and taxation laws. Is cloud ERP the better choice? How? Operating Costs - On-premise ERP requires a lot of investment. Since it is installed on local servers, enterprises need to have good servers. They also require a team of IT resources to manage and maintain the server and systems. Your IT resources will spend a significant amount of time on maintenance, reducing their value to your enterprise. ERP is a solution that needs to be upgraded with time. Upgrading an on-premise ERP is another labor-intensive task. It has to be redeployed across all user computers. All the customizations and integrations are lost and need to be re-implemented. Enterprises will not face this problem with a cloud ERP system. Their costs are comparatively low. Cloud ERPs are accessed through a web browser, and are hosted on the servers of the service provider. This data is secure and can be accessed by any device that connects to the internet. You will not have to invest on an IT infrastructure. They upgrade easily and also seamlessly integrate with your other systems. Ease in Upgrade and Enhancement - On-premise ERPs are highly customized and modified. They work well but once there's an upgrade released by the solution provider, all the customizations and modifications have to be re-implemented. Your IT team will again lose time in doing them from scratch. In fact, owing to these hindrances, enterprises refrain from upgrading their ERP systems and end up working on outdated software. Just like on-premise ERP, cloud ERP is also highly customizable. The difference is that cloud ERP automatically updates without affecting customizations. You can be rest assured that you are working on the best version of the ERP. Faster Implementation - Cloud ERP deploys faster. Any ERP implementation takes time and planning. However, comparatively it takes less time to implement cloud ERP, as you are not required to build an IT infrastructure. It can be deployed irrespective of geographies. It is flexible and scalable. You can provide access to more employees without having to invest in hardware. The faster you implement the better for your business. Enhanced Performance - Cloud ERP performs better than on-premise ERPs. It adapts to your needs. When your company's performance grows, the system grows, and is able to handle the surge in performance. It also provides real-time data that can be accessed by your resources on the internet. This empowers them with data that can be used to further propel your business. Cloud ERP also has enhanced security measures in place. Cloud solution providers adhere to stringent standards of security, as they are responsible for the data of their customers. They also provide additional measures like disaster recovery and data backup without adding to the cost of the service. For such measures, on-premise ERP will require additional investment of time and money. Cloud ERP systems are the clear logical choice. A study by Gartner urges CIOs to consider replacing their outdated ERP systems with cloud ERP. It provides enterprises the technological backing to move into newer markets and scale their business globally.